Gallium (chemical symbol: Ga) is chemical element 31 on the periodic table. Gallium is a metal, but it has some unusual properties. It's melting point is 85.58 Fahrenheit. If it is held in a person's hand, it will melt. It makes a stain on your hand when put on your hand. Gallium is safe in your hands but is NOT edible. Some Gallium Compounds can be very dangerous. Gallium does not conduct electricity well, and is known as a semiconductor. 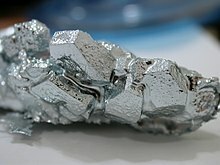 That means gallium can be used in computers to make them work. It is very shiny, so it is used to paint mirrors when melted. It's related to aluminium, indium, and thallium. This page was last changed on 12 September 2018, at 17:53.